A large Roman basilica was built behind and to the south of the South Stoa in the time of Caligula (A.D. 37-41) or Claudius (A.D. 41-54). The South Basilica in size and design has similarities with the neighboring Julian Basilica. 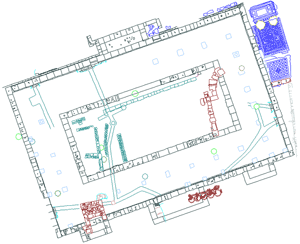 A large court for the South Basilica was built in the area of shops X and XI of the South Stoa. 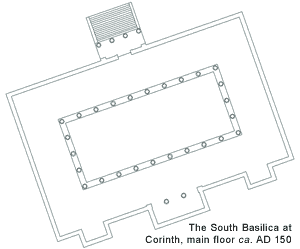 The basilica itself was a two-story structure with a main peristyle hall above a four aisled cryptoporticus. The dimensions of the outer walls are ca. 38.52 x 23.50 m, and the dimensions of the inner peristyle were 26.10 x 11.80 m. Three large exedrae were built into the rear, south wall of the basilica. There is some evidence for repair of the building during the last quarter of the first century A.D.
Weinberg, Saul S., Corinth I, v, Results of Excavations conducted by the American School of Classical Studies at Athens, The Southeast Building, The Twin Basilicas, The Mosaic House. Princeton, 1960, 58-77.